The Power of Hypnobirthing; 10 reasons why it's for you is a must-read book if you are unsure whether to book onto a hypnobirthing course. 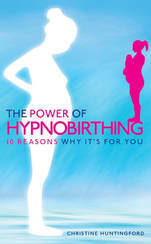 It will give you insight into how effective hypnobirthing is. It will give you 10 reasons how it can enable your birth to be a more positive experience. By having the correct information during pregnancy and understanding the choices that are available to you, you can be in control of your birth experience. Who is responsible for your baby's birth? This is a really important question to consider. If you think it is your caregivers, the NHS, your midwife or your consultant, you need to reconsider. YOU are responsible for your baby's birth. That means that you need to know what choices you have available to you. You need to know the risks and benefits of these choices and how they apply specifically to your body and your baby. This is what a hypnobirthing course teaches you and this is what the book talks about, as well as the many other aspects surrounding a course. Investing in a course will be upwards of £200, wherever you go. The course is a worthwhile investment. But if you're still not sure, buy this book today and find out more. The book is only £5.99, and within it is a code that gives you 10% off any face-to-face course that you buy. So in the long run, you will save money by buying the book. Can't wait to read the book?​ Fill in the form below and get the first chapter straight away. Find out about hypnobirthing and how it enables a calmer birth experience. Complete the form below to get Chapter 1. By submitting this form I am happy for Magical Baby Moments to contact me during my pregancy about hynobirthing matters.